Whether you're baking with cake mix or baking cakes from scratch, these helpful hints will save you both time and money in the kitchen. From sunken cakes to dry cakes, these tips and tricks will give you the knowledge you need to make perfect cakes every time. If you want to become a cake baking pro, the first thing you'll want to do is check to make sure your oven is heating at the correct temperature. If you've ever experienced common cake baking problems such as a sunken or collapsed cake, this could be because your oven isn't getting as hot as it says it is. An oven that's too hot could cause a dry cake. Invest in an oven thermometer -- your cakes (and cake tasters) will thank you! Cakes baked in glass versus metal bake differently. If using glass, you'll want to lower your oven temperature by 25 degrees. Preheat your oven before you start mixing and prepping -- it's best if the oven is preheated for 20 to 30 minutes at the proper baking temperature. Be sure to use the correct pan size called for in the recipe. Fat, eggs, and liquid (eggs, butter, milk, etc.) should generally be used at room temperature. Cold ingredients could cause the batter to curdle. When combining butter and sugar, take your time to cream them together -- beat or cream together for at least 5 minutes. This helps to ensure a lighter cake, as it adds tiny air pockets to the batter. Sugar granules shouldn't be visible, but you can still feel them if you rub a bit of the mixture between your fingers. Measure flour and other dry ingredients exactly. Use a knife or other flat surface to level off dry ingredients in a measuring cup or spoon. And don't skip the sifting! This step helps to add air and ensures that all dry ingredients are properly combined. If you don't have a sifter, you can use a wire mesh strainer. 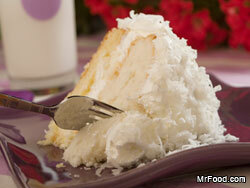 When baking foam cakes like angel food cake, take great care when adding the flour to the beaten egg whites. Fold the flour in three stages, very gently so that you don't lose the airy volume of the egg whites -- this is what keeps the cake so light. Generally, the cake batter should fill the pan by at least 1/2 and not more than 2/3, unless otherwise instructed. Try to bake the cake in the middle of the oven and, if baking more than one cake at a time, don't crowd them together, or they will bake unevenly. For crumb-free slices, run your knife under hot water and dry it before cutting into the cake. Always wait for cakes to cool completely before frosting. 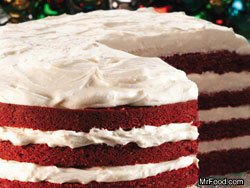 Even the slightest warmth from a cake can quickly turn your frosting or icing into a mess. Brush your cooled cake with a pastry brush (or your fingers if you don't have one) to remove excess crumbs. Begin the frosting process by first applying a very thin layer of frosting to the cake. This is known as a "crumb coat." It will help to seal in the crumbs, and you can further help this process by refrigerating the cake for an hour or so at this point. The frosting will harden slightly and really hold in the crumbs. Now, you can frost as you normally would, starting with the top and finishing with the sides. For a truly perfect presentation, wipe the spatula clean each time you swipe frosting onto the cake. You may want to spread it on smoothly for a clean finish, or you may opt to swirl it decoratively around the cake. Check out our "How to Frost a Cake" video for even more guided information! Just click here. Dry Cake: As mentioned above, this could be caused by an oven that's too hot. You may need to calibrate your oven or bake at a lower temperature. You may also have baked your cake for too long. Alternatively, a dry cake can be caused by too much flour or baking powder. Sunken Cake: This can be caused by too much liquid, or an oven that's not hot enough. If the oven isn't hot enough, this could actually be a result of opening the oven door too many times while your cake is baking. In general, try to wait until the cake is nearly finished baking before you open the door. Difficulty Removing Cake from Pan: Make sure to properly grease and flour the pan before you add the batter. You may also want to try lining the bottom of your pan with parchment paper, especially when baking layer cakes. Be sure to remove the cake from the pan at the right time; allow the cake to cool in the pan on a wire rack for 5 to 10 minutes, then invert it onto a plate or rack to remove it from the pan and allow it to cool completely. No cake flour on hand? You can substitute this by using regular all-purpose flour and cornstarch. For each cup needed, start by adding 2 tablespoons of cornstarch to a 1-cup measuring cup; fill the cup with all-purpose flour and level the top. Self-rising flour is not to be used interchangeably with all-purpose flour. The difference is that self-rising flour has baking powder already in it. If you want to substitute all-purpose for self-rising, you can add 1-1/2 teaspoons baking powder and 1/2 teaspoon salt to 1 cup all-purpose flour. 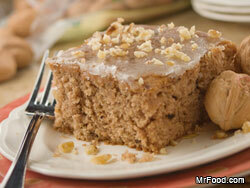 To lower fat and calories in your cake, replace half of the oil with applesauce or yogurt. This will add moisture without adding fat. 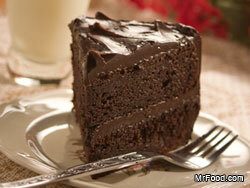 Ever wonder why chocolate cake recipes call for boiling liquid to be added to the batter? The hot liquid helps to release the flavors of the chocolate. If you're baking a layer cake and can't quite figure out how to divide the batter evenly between pans, you can stand a knife in each pan to see if the batter is measuring up to the same point. Most cake recipes can easily be converted to cupcakes. The average cake recipe that would produce two 9-inch cakes should generally make enough batter for 24 to 36 cupcakes. Oven temperature should be kept the same, though baking time will change from anywhere between 15 to 30 minutes, depending on the recipe. You'll have to keep an eye on them! Got more questions on how to bake a cake? Leave it for us below in the comments section, and your question could be featured in our next Q&A with the Test Kitchen! I have a problem of getting my cake done all the way thru. I have a ribbon like thru my pound cakes as if not completely done. I have bought a new thermometer & had the oven checked out. I can't make a cake or miniature pound cakes, help!!! Hi there Kay! We're sorry to hear you're having trouble with your cakes. Here are some tips that may help you out: Pound cakes should always be baked at a lower temperature for a longer amount of time. Butter should always be softened, and be sure to grease and flour your pans before making the batter, so that you bake your cake immediately. You don't want it sitting and waiting to be poured onto the pan. Also, butter pound cakes always use a leavening agent, either baking powder or baking soda. Hope these tips help! Hi, The cake I baked on Sunday was not soft. The cake was hard. Why did this happen? Should I add more butter next time? Another question, can I add mashed banana in the batter? Hello! Could you please let us know what recipe you followed? We would need the recipe to better advise you on what may have gone wrong. Adding butter does not necessarily make a cake softer. One general tip for giving your cake a light and airy consistency is to make sure that you cream the butter and sugar very well. The cakes that I baked have a hard crust at the top. Wonder what went wrong. Please advise what to do to improve it. Thank you. Hi there! It's hard to say exactly why you're getting a hard crust. However, some reasons can be: too much sugar in the cake, overcooking the cake, oven too hot, or baking the cake too close to the top of the oven. Hi everyone,this is my first visit to this blog. My deepest concern is,then other day when i baked a chocolate cake the center of the cake rised up too much and gave a crack on the top.Wonder whta went wrong!!! Just baked a cake containing 1 lg can sliced peaches (drained) and crushed in large bowl. Measured carefully & added 2 c. all-purpose flour, 2 c. granulated sugar and 2 teaspoons baking soda. Mixed ingred. well. Baked in 9X13 sprayed pan @350 for 35 minutes. Now have a cake that is sunken in the center. I used an oven thermometer and cake tester. Question: Could the canned, drained and mashed fruit be the problem? Cannot take this to the potluck tomorrow so now have to make something else...(sigh) Please help! Hi to everybody, it's my first visit to this blog; this blog includes awesome and excellent information designed for readers. Thanks! this is the recipe for a pound cake ive been looking for ever thank you mr.foods for sharing the recipe I know it will be great It may be pricey but it will be well worth it!!! MISTAKE!!!! TYPO!!!! The 3/16 answer I submitted should read this way: Sometimes you really don't need to SIFT at all. It depends on how the recipe is written. If it says, for example, 2 cups flour, sifted, then you measure first. If it says, 2 cups of sifted flour, then you sift first. When in doubt, sift then measure. Sometimes you really don't need to measure at all. Let the recipe be your guide. Do you sift flour first, then measure... or measure and then sift? The volume of flour is always more after sifting. The cake bakes faster on the outside that is nearest the pan because the metal/glass is conducting heat there. The center is farther away and thus takes longer to bake and allows more time for the batter to rise. You can combat this in two ways, or combine them for even better results. Use baking strips that are dampened around the outside of the pan. If you don't want to purchase the commercial strips, you can rip a terry towel, wet it and wring it out. Fasten those to the cake pan. Second, get a METAL flower nail (available in the cake section at craft stores) and prepare it the same way you prepare the pan. Place the metal flower nail in the center of the pan, flat side down then add your batter. When the cake has baked, and you are turning it onto the cooling rack, make sure that the nail is pointed toward a hole in the rack. After the cake is on the cooling rack, and the pan is removed, gently lift the flower nail out of the cake. Only a very tiny hole will remain and will not be seen when the cake is iced. This method works because the baking strips keep the outer edge cooler longer and the flower nail conducts heat to the center. Using both methods together goes a long way to even the time it takes the cake to bake throughout, and largely eliminates the dome. If you still have a slight dome after that, you can gently press down over the top, or just slice it off to level the cake. I hope this answers your question and helps you avoid the problem in the future. I have asked several people and can not get an answer to this question. Most of the cakes I bake peak up in the middle like a mountain peak. What am I doing wrong? Helpful comments. What causes cakes baked in round cake pans to have a peak in the center?